Grindelwald is one of the world’s classic resorts with wealthy history that dates back to the early 1880s. Set in the magnificence of the Alps, the resort shares one of Switzerland’s larger ski areas with neighbouring Wengen, which is possible to reach on skis, and Murren that requires trains and lift rides to reach. Despite the extensive skiing facilities, Grindelwald’s scenery draws photo-hungry due to dramatic panoramic views of the mighty Eiger and neighbouring peeks. The village is also suitably charming with its wooden chalets neatly hemmed in by the surrounding mountainscape. Managing director of Grindelwald Tourism, to tell us about this resort in more detail. – Bruno, could you tell a little about the location of the resort? Grindelwald is part of the Jungfrau region in the Bernese Oberland. It is located near three famous and glorious peaks: Eiger, MÖnch and Jungfrau. Extending from west to east, the Grindelwald valley is 16 km long with the Black LÜtschinen flowing through. It is bordered in the south by the FiescherhÖrner and Eiger, in the west by the Kleine Scheidegg, Tschuggen and MÄnnlichen, north by Faulhorn und Schwarzhorn and to the east by Grosse Scheidegg, Wetterhorn and Schreckhorn. Surrounded by stunning alpine scenery at the foot of the Eiger North Face, Grindelwald is worldwide known as the glacier village – and I am proud to say that it is a magnificent place! – What about the history of this resort? The tourism industry in Grindelwald began in the late 18th century as foreigners discovered the scenic town. Pictures of the vistas were widely reprinted, quickly making the village internationally famous. The first hotel named «black eagle», opened in 1820 and by 1914 there were 33 hotels in Grindelwald. In 1888 the first winter season was officially opened. Numerous ski lifts, cable cars, hiking trails and alpine huts were built in the late 19th and 20th centuries to allow tourists to explore the mountains. Today, almost the entire economy of Grindelwald is based on tourism. – What can you say about the characteristics of Grindelwald ski area? With a total of 155km of groomed slopes in the areas of Grindelwald-First and Kleine Scheidegg-MÄnnlichen, Grindelwald has lots of tracks for both beginners and amateurs, as well as for professionals and people who likes to tickle the nerves. Grindelwald-First is the sunniest section of the Jungfrau region and is particularly suitable for families as well as young and young at heart who want to test their skills in the freestyle park. In the region of Kleine Scheidegg-MÄnnlichen is where you find pistes for every level from beginner slopes to the World Cup Lauberhorn downhill. This allows you to enjoy plenty of skiing and get maximum pleasure! – How long does the ski season last? Is the weather stable? The weather in Grindelwald is very pleasing in the winter. The season lasts from late November to April and this is pretty enough to taste all the delights of the resort! But with the closing of the ski season in Grindelwald life does not fade. In the summer time there are 300 km of hiking trails and bicycle routes of different difficulty levels. – How does it work with the ski schools? What kind of lessons and programs do they offer? Grindelwald has several ski schools that offer group and private lessons. They teach alpine and cross country skiing, snowboarding and even ice climbing. The qualified instructors will give anyone, both young and old, from beginner to experienced skier, an unforgettable time on the slopes. They teach with passion, patience and personal commitment while having fun. All the ski schools offer high-quality snow sports instruction and it is their aim to continually improve in order to completely satisfy their guests. 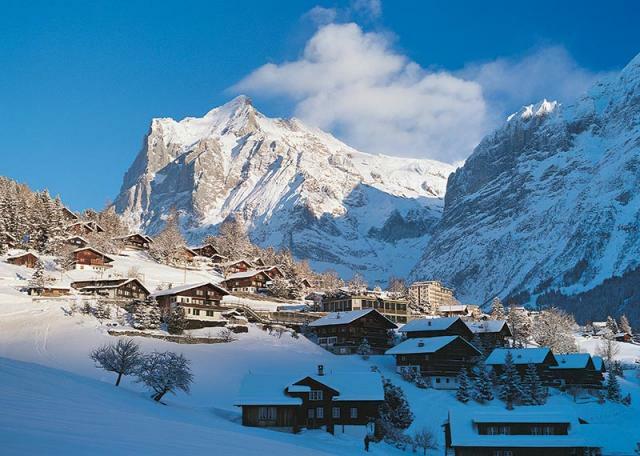 Apart from the ski areas that are suitable for families, Grindelwald has even more to offer. With more than 70km of winter hiking trails and toboggan runs with a gigantic mountain panorama, the Eiger village is also a paradise for non-skiers. With the First Flyer zip line you fly on a cable from First to Schreckfeld. With 800 metres of steel cable, up to 50 metres high and speeds of up to 84 kilometres per hour, the First Flyer promises pure thrills for the whole family. The sports centre in the village combines the Alpine spirit for sport with the calm of the mountains and whether you enjoy swimming, ice-hockey, curling, relaxing in the sauna oasis or being bold and attempting climbing in the indoor Rope park and Boulder area, you will find your perfect offer at the sports centre. The sports infrastructure in Grindelwald complies with the most modern requirements and promises various active holidays for the whole family. If you want to escape from sports entertainment, you can go through the numerous shops, sit in a cozy restaurant and dance at a disco in the evening. – At the end of a fulfilling and exhausting day of skiing, what would you recommend to do? A delicious drink in one of the many aprÈs-ski bars in Grindelwald is the perfect way to end a beautiful snowy day. Various bars and discos provide year-round entertainment. For culinary highlights you can choose from around 50 restaurants in Grindelwald – from rustic and traditional Swiss cuisine to international delicacies, there is something for everyone. Food and sports shops, clothing boutiques and souvenir shops invite you to stroll through the streets of Grindelwald. – How do I best get there? The drive by car from Zurich is about 195 kilometers, from Basel 175 km, 205 km from Geneva and 70 km from Bern. By train you can reach Grindelwald within about 3 ½ hours from Geneva, 2 ½ hours from Basel and Zurich and in 1 ½ hour from Bern. – Are there any special offers for buying or hiring ski equipment? In one of the many sports shops in Grindelwald and the Jungfrau Region you can buy or rent the latest and best equipment of the season. The top-equipped test centres on First and MÄnnlichen allow renting, testing or exchanging the ski material directly up on the mountain.